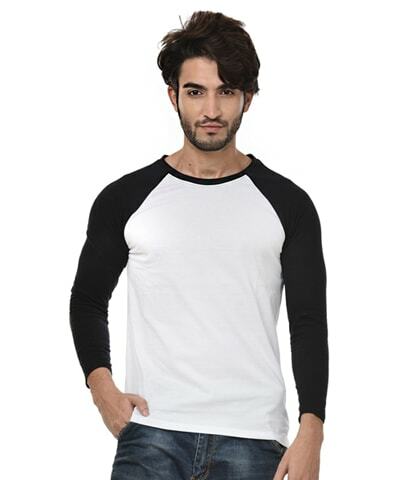 Men's raglan t-shirt full sleeve, solid white-navy colour, softest, smoothest, good looking regular ..
Men's raglan t-shirt full sleeve, solid white-black colour, softest, smoothest, good looking regular..
Neevov offers raglan t-shirts for men with custom four distinct sizes. Neevov has attained license and trading for Raglan T-shirts these are available with ease and comfort styles. By and the large raglan t-shirt has two sorts blended shading texture with the full sleeve, half sleeve, and round neck style. Raglan T-shirt has used ring-spun brushed cotton, single pullover, and 180 gsm texture quality. Raglan shirts online shopping looks pleasant because which worked by joined by two hues garments. It can wear individuals during the summer season, rainy season and low winter season. We take incredible care to give you these attire at the best of its quality and outline. Neevov.com in India endeavors hard to help you characterize your remarkable style explanation with most extreme solace and mold bid. Every one of our arrays is intended to meet top-notch gauges with appropriate shading speed, uniform coloring and furthermore shrinkage control. Raglan T-shirts appear to be the most monetary easygoing wear of all circumstances that arrive in a wide assortment, making you look cool and stylish. Our gigantic accumulation of Raglan t-shirts is produced from quality textures and additionally very much qualified fit and style consultants. We are excited about giving the correct sort of items to fulfill the stylish tastes and inclinations of the frame. Custom Raglan t-shirts are the symbols of the design business making you look cool and in vogue. In India, Neevov.com is created to coordinate with your tastes and inclinations. kids plain t shirts India and spaghetti tops are good clothing during summer season. 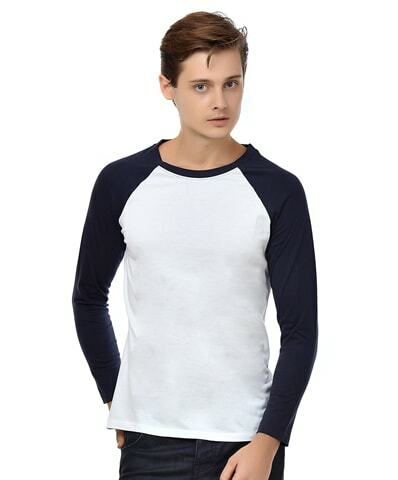 There is two color combination men’s white navy Raglan T-shirts full sleeve & men’s white black Raglan T-shirts full sleeves are available at Neevov.com in India. Our great fit Raglan t-shirts are anything but difficult to style closet staples and, because of their magnificent quality, keep up their shape and hues for a considerable length of time to come. Pick our Orange Label to extend for up-to-date men's Raglan t-shirts India that you will wear through all seasons. You can't have enough T-shirts, so look at our Vintage t-shirts, long sleeve styles and printed t-shirts for an excellent determination of the most recent landings. Our men's t-shirts likewise come in slipover and group neck styles. Product Details: White and navy blue color blocked waist length T-shirt, has a round neck, long raglan sleeves, Material & Care,100% cotton, Machine wash etc.